Over on Fox News, Florida Sen. Marco Rubio, a Republican elected in 2010 with Tea Party support, has said he will not vote to confirm Hagel. Hagel responding to Georgia Republican Sen. Saxby Chambliss on the idea of negotiation with perceived enemies. So far at #Hagel hearing lots on Israel, Iran and nukes but little to nothing on counterterrorism, drones and GITMO. 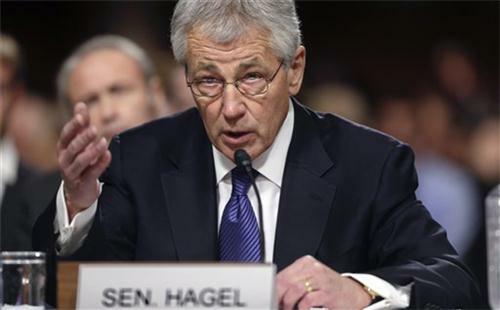 Hagel is no shrinking violet on his past positions, but he is clearly trying to be contrite enough to hew to Obama administration positions and minimize the impact of his more controversial past statements. It's unclear if there are any minds that remain undecided in the Senate and if any decisions hinge on his performance today. The committee is slowly returning from its 10-minute recess. Two topics absent from this morning's discussion: drones and Gitmo. Republican Sen. Kelly Ayotte, a new member of the "Three Amigos" alongside McCain and South Carolina Republican Sen. Lindsay Graham (replacing outgoing Independent Sen. Joe Lieberman), begins the afternoon questioning of Hagel. This provides Ayotte an opportunity to build street cred among her colleagues and those watching the hearing as welll as show off foreign policy bona fides. Sen. Levin announces one hour recess for debt-limit votes. He says the committee will resume five minutes after the final vote. Three senators have yet to ask their initial questions of Hagel - they will get that chance once the committee resumes. Then the panel will begin a second round of questioning.